DE10 Locomotive – Co-Bo or AAA-B? Any idea what I'm talking about? It's the wheel arrangements of diesel/electric locomotives. As per the old steamers (Whyte Notation) and their arrangements of 2-6-4 or 4-8-4+4-8-4, more modern locomotives use a similar nomenclature known as the UIC classification. The basic idea is that, per bogie, a letter starting from A is assigned, determined by the amount of wheelsets; where a wheelset is 2 wheels plus an axle. The letter is incremented from A for each wheelset. A bogie with two wheelsets will be defined as a Bo, 3 wheelsets means a Co.
You'll notice I put the letter 'o' after the B and C above. This is because, on some locomotives, the wheelsets can be mounted on the frame. The 'o' indicates that the wheelset is mounted on an attached bogie. I was about to write that I hadn't officially seen an 'Ao' yet; wouldn't the bogie spin on the wrong axis and derail? It turns out that it wont if you mount it correctly. The Japanese DD54 (wikipedia.jp) is of class Bo-1-Bo. I do note that it's not an 'Ao'... but it is indeed a bogie with only one axle! As above, not all wheelsets are mounted on bogies, and not all wheelsets have power attached, so you'll need to read the wiki link on UIC classifications to really get the full picture. My favourite Japanese electric, the EF-66 as seen below, is a Bo-Bo-Bo. This majestic piece of equipment therefore has three bogies with two driven wheelsets each. The Japanese fashion is to have traction motors strapped onto each axle in parallel. 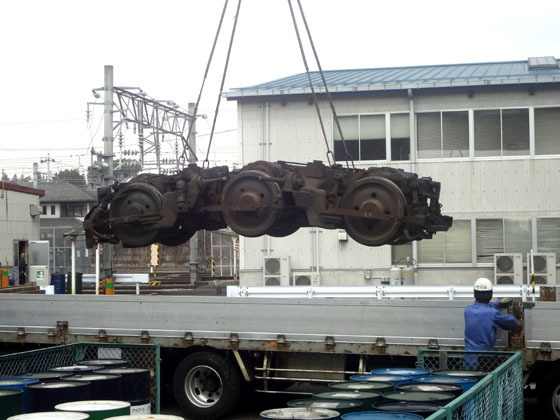 This is one of the more light-weight, shunting-type locomotives used around yards in Japan or for shorter freight movements. It's seen below at Aomori, ready to pull the passenger consist of the Nihonkai that I travelled on away from the EF81 that was ready for a snooze. I recently acquired a Micro-Ace model of one in the Watarase Railway colours. Gold and Maroon is really quite fetching over the standard Red/Grey/White/Black. Anyway, back to the point, I was reading the back and saw that the 'real world' technical specifications indicated that the wheel arrangement was infact AAA-B (where that B can be translated to a 'Bo'.) I was expecting Co-Bo... not AAA. What gives? It turns out that, for tractive effort and weight distribution, the front bogie is actually articulated! So they've classified it as three mini-bogies of one driven axle each.